Well, since NA WG staff just plain LIES to portion of their playerbase about moving the account to EU after WoT NA server merge, this comes as little surprise. Agreed. It makes it look like a cheap mobile game that says "free" when you download it, only to find if you want to actually get to do anything fun or get something cool in a timely manner, you have to pay your way into those things. WoWP really IS free-to-play, not "free" only on the App store(just a reference to mobile games, I know WoWP does not have a mobile version) or "free" in name only or in appearance only. Combat Reconnaissance Premium Account purchase NON-results. I bought some Premium time . It did not show in the Combat Recon pop-up. It DID show up on the top left corner as Premium day credits. Did note while buying it from the Premium Shop a message that it will show at next game restart. No, it still didn't show in the Combat Reconnaissance pop-up screen after cold booting the game including shutting down everything in the background with Task Manager. Edited by Deltavee, 21 March 2019 - 08:20 PM. It is added as you go along. Just now finished the Attack Aircraft requirement and received 50 gold right away. I also got six aircraft kills while doing it, which is something out of the Twilight Zone in an IL-2 (mod.). Stranger and stranger. Edited by Deltavee, 21 March 2019 - 08:43 PM. You get a free premium plane for joining via steam. You called it, legoboy. You were literally right on the money. Click on your name top left corner, buy Premium time with 250 gold from the drop-down menu that you would have no clue was there if you were a new player. WELL, that's really obvious, isn't it? Especially if you're a new player. Now I'm just pi**ed. It should be made obvious or included in the instructions but this way they get people to just go to Premium and buy Premium time and get NO credit in the Recon. ****i** slime****s. I don't know if they're farming players or just stupid. Piper Cub with a handgun? Sounds like a good poll question as long as one of the choices is 'All of the above'. Flippin A right they are paywalling people. I said flip it. I am just going to get in a toon and wreck it ralf all over the place. THe heck with their missions and GIVE ME $$ for nothing. Rather spend my money on beer and get college girls drunk. I discovered the Premium plane mission just as I was done with flying and heading for work. I expected to find this thread by the time I returned, or by Dog I was going to start it. I am disgusted and VERY ANGRY at this utter bovine suppository move by WG. not cool, not cool at all. This is where I stop posting for tonight because the next post is going to get me banned for a month if I put it up. Это место, где я прекращаю публиковать на сегодня, потому что следующее сообщение будет забанить меня на месяц, если я его подниму. Edited by Deltavee, 21 March 2019 - 11:10 PM. To be honest, I have no idea what you are talking about. upon further review, I must retract MOST of my anger at this. 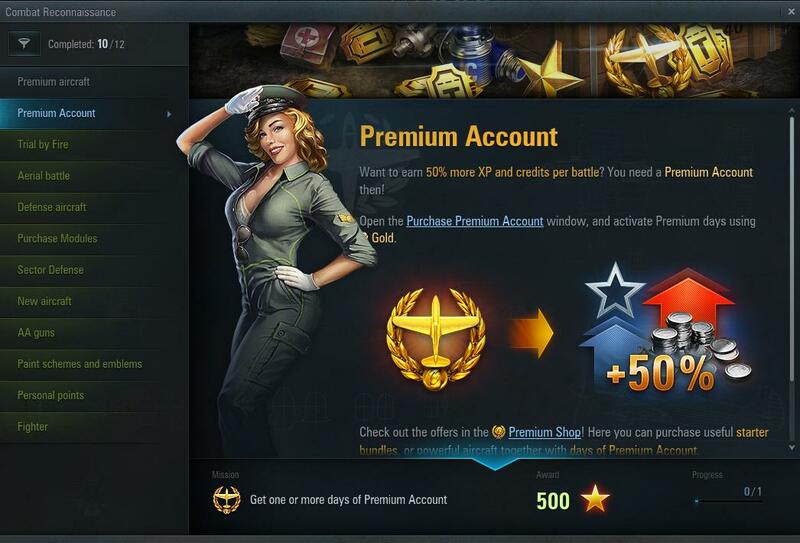 It is possible to earn enough gold on the Recon Missions to purchase several of the cheapest Premiums, and as mentioned above, the Mission for a day of Premium Time counts. I still think that the optics are bad, it's still a potential cash grab, and I NEVER appreciate "you should have read the fine print" as a Customer Service response. that being said, I am mollified and do apologize for the earlier angry post. The Premium Account purchase requirement did not show up as completed but showed 0/1 and it stayed that way after I bought a single day through the premium shop (of course) and legoboy suggested it might have to be bought through the game and he was right but the counter still didn't change. It wasn't the lousy $1.88 that generated my post, it was not getting something I had paid for. WoWP's overall attitude towards money and players is not of the type that suggests confidence, hence my post. Note my post was only about the Premium day, nothing else and I have otherwise enjoyed the spectacle and yes, the reward gold is provided on an as-you-play basis which I found to be a pleasant surprise. Colour me calm. The above problem aside, I am enjoying the whole Combat Recon experience. I did take a Chain Lightning into the Heavy Fighter requirement and made a tasty snack for a variety of jets but that's neither here not there, just a surprise. We won. I got 50 gold for it. Wagged tail and moved on. Edited by Deltavee, 22 March 2019 - 05:22 PM. Thank you, this is exactly what I discovered. 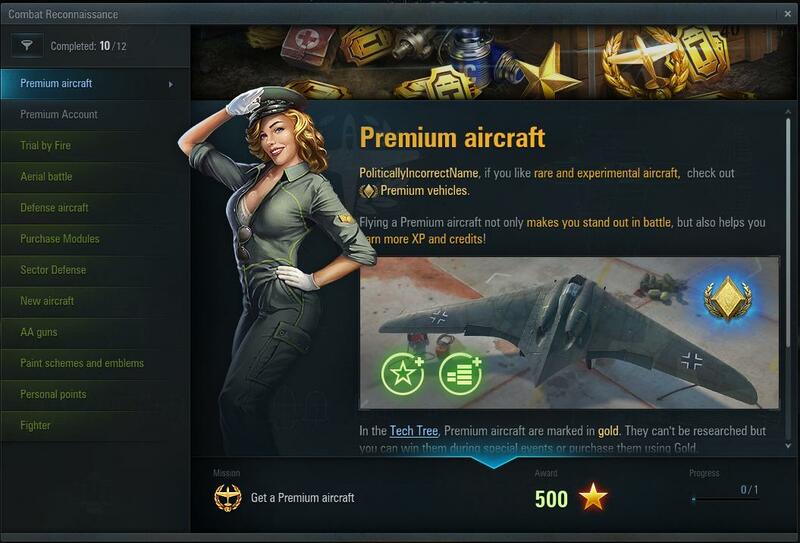 The thousand free gold basically is so that you can start with a free premium plane. My only issue (at this juncture) is that if you've been playing already for a while and have bought most or all of the low-tier premium planes.. completing that mission is going to be expensive for the completionist. Perhaps if you've already -bought- a premium plane it should be an auto-completion? Where are you seeing 1000 gold? Two recon missions paid out 25 and 50 gold. I’ve finished the 10/12 with the two contentious Premium missions remaining that show 500 free xp for award. edit: All of a sudden I have a 13th mission for 100 gold. How many mission are there? Edited by Bubba_Zanetti, 22 March 2019 - 08:22 PM.